WELCOME TO THE GLOBAL CHANT DATABASE! This is a searchable database of plainchant melodies and texts included in medieval sources and new editions. It serves as a simple tool for searching information on Gregorian chant and other medieval monody including sacred songs. At this time the database contains almost 25.000 records of chant incipits that provide information about text, melody, genre, modus and concordances in new editions and other on-line databases. Some of the records include also hypertext links to facsimiles where a particular chant can be found. The Global Chant Database was developed by Jan Koláček - PhD student of the Institute of Musicology at the Charles University in Prague. 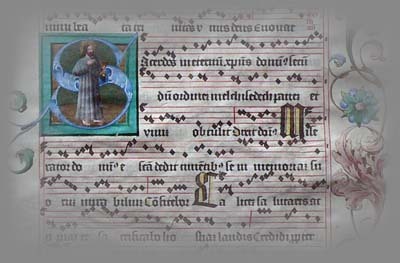 The database is intended as an easy tool for scholars and students to search and identify plainchant melodies with a possibility of displaying the sources. The purpose of the database is to comprise the chant incipits of all important editions of plainchant and medieval manuscripts. The melody encoding scheme is compatible with the font 'Volpiano' and other melody codes - this enables to make links with other chant databases. The Global Chant Database is intended as an open system with external contributors. Scholars and students doing a research on a medieval music source can contribute to the database using a special application that enables easy melody input. For more information on cooperation, please contact the database administrator. GCD is now connected with the Bible! For browsing chants inspired by Holy Scripture go to Bible search. Hymn melodies from the Cantus Planus database were added to GCD by courtesy of Prof. David Hiley. Chant incipits from Hymni et sequentiae (Budapest, 1956) by Benjamin Rajeczky were added to the database. References to Schlager's Alleluia catalogues were added with kind permission and help of Dominique Gatté.